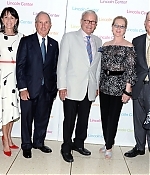 On Wednesday, Tom Brokaw was honored for his continued contributions to the always-anticipated Mostly Mozart Festival each year at Lincoln Center. His introduction was given by Meryl Streep. “As a journalist, Tom has not only reported and delivered the news, but he has represented a certain kind of authority in our culture. Like a dad, he explains stuff to you without talking down to you. Or, when he was younger, a super smart, super straight-shooting, reliable friend. 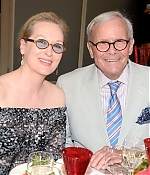 A narrator of our lives,” Ms. Streep said during her introduction. “Although he has received more awards, and more accolades, than anybody in his profession,” she later added in closing with a laugh, just before folding her speech papers into Mr. Brokaw’s breast pocket. “May I say, as someone with deep experience in this area, just one more isn’t going to kill you!” Pictures from the event have been added to the photo gallery, with many many thanks to my friend Claudia.